Do you remember how my camera ate my memory card and I ended up losing all of my recent pictures? I had already written this post but didn't have a picture to put with it. I found a picture on my blackberry phone that I had sent to my hubby at work, so now I can share it with you. I also made some regular Homemade Oreo Cookies using this fudge cake mix. They were delicious! If you're asking if I'm obsessed with Oreo cookies, the answer is YES. I love them! This was written on December 4th. Today we are decorating our Christmas tree and home to get ready for the holiday season. My 3 girls also have a Christmas tree to light up their bedrooms, so that's 4 trees to decorate in one afternoon. I'm already tired just thinking about it. Some of these cookies and multiple cups of coffee should help get me through the day! I lost all the pictures of my girls decorating their Christmas trees...this makes me so sad. These cookies are simply the best of both worlds. Rich buttery cookie dough using semi-sweet chocolate chips is nestled between two chewy fudge cookies topped with milk chocolate chips. 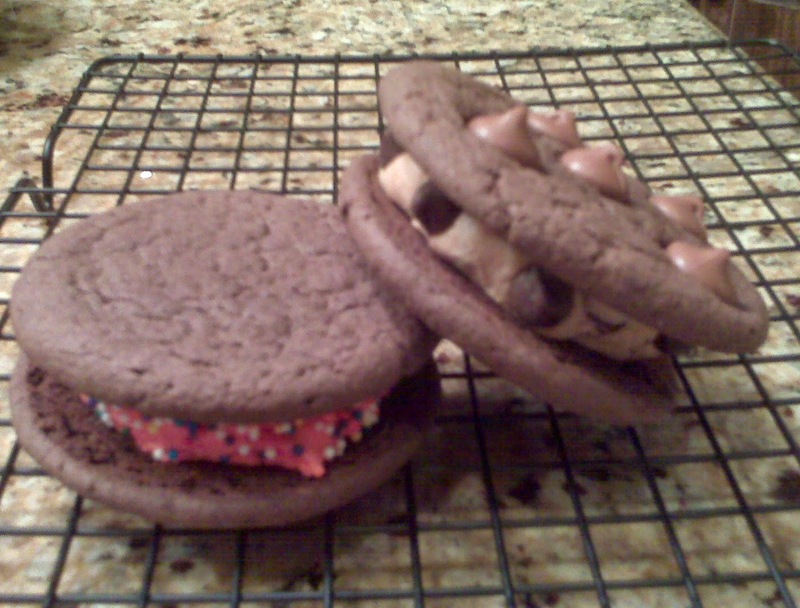 The fudge cookies were easy to make using a boxed cake mix. The cookie dough is homemade and does not contain any raw eggs, just in case you were worried. Now onto the cookies! Preheat the oven to 350 degrees. In a large bowl, add all the ingredients and stir well. Form into walnut sized balls and place on non-stick baking sheet. Use a round glass to slightly flatten the dough balls. Press some milk chocolate chips into the top of half of the cookies (these will be the top cookies). Bake cookies for 8 minutes. Remove from the oven and let sit on the hot baking sheet for another 5 minutes. Place cookies on a wire rack to cool completely. In a large stand mixer, cream together the the butter and brown sugar until light and fluffy, about 2 minutes. Add the vanilla extract and mix. Add the flour and salt and mix until incorporated, then add the chocolate chips. Add the water, starting with 2 Tablespoons. Add more water as needed until thick cookie dough forms. Refrigerate cookie dough for about 30 minutes. To assemble the cookies, match up your cookie tops and bottoms. Take some cookie dough and roll into a ball. Flatten slightly with your hand and put in the middle of two cookies. Place some semi-sweet chocolate chips around the outside of the dough to make it look pretty. They are ready to eat with a big glass of milk or a strong cup of coffee. Enjoy! Oh my! Could a cookie get any better?? Another winner! These look amazing.